Happy half way to 100! Don’t let getting older put you down in the dumps. Show that you’re getting better with age and flaunt it with 50 Fanci-Frames. These frames are plastic novelty sunglasses without lenses done in a metallic finish. Give your guests a good laugh and celebrate another year of being great with 50 Fanci-Frames. 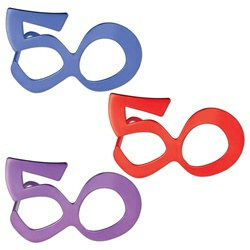 These fanci-frames are available in assorted colors of blue, purple and red (specific colors cannot be requested). Be sure to decorate the birthday girl or boy with Happy 50th Birthday Beads of Expression (1/pkg), 50 Satin Sash and 50 Glittered Bopper.